Two teachers at Oak Forest Elementary School felt strongly that their students needed more hands-on learning experiences in science, math, and nature studies and reached out separately to two Texas Master Gardeners volunteering at Mercer Botanic Gardens, Mrs. Sanders and Mrs. Opperman. In 2003 Mrs. Sanders and Mrs. Krenek, a 5th grade science and math teacher, started an organic vegetable garden program for 5th graders. 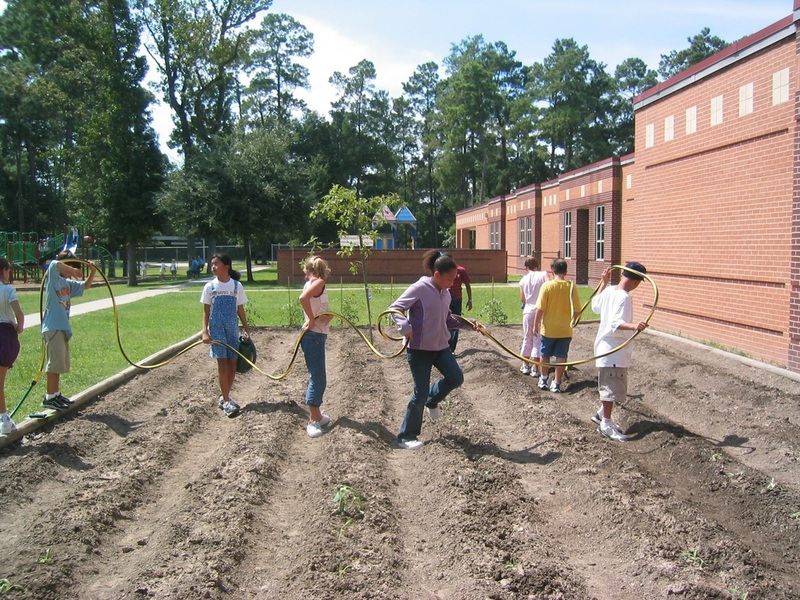 Mrs. Sanders, Mrs. Krenek, and OFE's Mrs. Wolf and their families broke ground in 2003 for the garden. In 2005 a garden shed was built, moved to the school site, and painted red. Mr. Sanders, Mr. McMullen, Mr. Opperman, Mr. Carey, and many other volunteers worked together on this project. In November 2017 wooden benches and teacher's station were relocated from a wooded area to the school annex, which is near the little red shed and main and annex student gardens. A plaque on the annex wall honors OFE Growers volunteers Jo and Ken Sanders for their work in establishing the outdoor classroom, which is open to all OFE students and teachers. ​In 2003 special education teacher Mrs. Cardoso reached out to Mr. and Mrs. Damien Carey, both naturalists, to establish a nature club at OFE. Mrs. Opperman was asked to plant the campus with native and pollinator-attracting plants in order to make the campus eligible for the Schoolyard Wildlife Habitat certification. The pollinator beds with their educational signs were the project of Mrs. Opperman as part of her Master Entomology certification. Entomology professors at Texas A&M University contributed to the project. A beehive on campus was discovered and preserved by placing a cedar fence around it with an educational sign. The hive is often unpopulated. In 2007 trees belonging to the school were mistakenly bulldozed as adjoining property was cleared for a shopping center. As a result, 125 native trees and shrubs were planted along the east property line to recreate a natural area next to the school. An orchard was also created in 2007 along the boundary line of the shopping center. There about 20 fruit trees now provide food for the 5th grade math, science, and organic garden program in addition to serving as a wildlife habitat with chimney swift tower, purple martin houses, bird feeders, and bird bath. Other projects include the following: a weather station, informational signs on campus, and an annual tree planting by the 5th graders for Arbor Day. Initially Mrs. Krenek and Mrs. Cardoso sought donations to fund projects. For a while the Humble ISD Education Foundation provided funds. In 2012 volunteers applied for and got 501.c.3 nonprofit status for their group named OFE Growers, Inc.
From the beginning funding has come from ExxonMobil VIP (Volunteer Involvement Program) and team grants. Donations for preserves made from the summer gardens and orchard have become a significant amount of our funding in the last few years. ​Local businesses that have supported the Growers over the years include Kingwood Country Club, Alspaugh's Ace Hardware of Kingwood, Lowe's of Atascocita, and MicroLife Organic Fertilizers of Houston. Online, individual purchases made through AmazonSmile automatically help support OFE Growers. And, without thousands of hours of volunteer time, the 5th grade science, math, and organic gardening OFE school program would not have been possible. ​With donations from businesses and the local community, OFE Growers maintains outdoor classroom furniture in the annex; pollinator beds at the front and back of the school (front entrance, marquee, and Monarch Waystation); vegetable beds in the main, annex, and orchard gardens; and fruit trees and grape vines in the orchard and main garden.